Here is my comment on a recent article titled Krugman’s Craziness that appeared in the New York Sun. –t.h.g. Very few people today, including prize-winning economists, possess a deep knowledge of the fundamental principles of reciprocal exchange, and most of those who do are committed to maintaining the global interest-based, debt-money regime that enables an elite few to control economies and governments worldwide. In the wake of the 2008 financial meltdown and the ongoing economic crisis, more and more people are waking up to the fact that there is something seriously wrong with our systems of money, banking, and finance, but remain mystified by it and have no idea what to do about it. Many are calling for reform of the system via the political process, and most reformers want a return to the gold standard and favor a government monopoly over the issuance of money. Clearly, new legislation is needed to reverse the trend toward ever greater centralization of power and concentration of wealth, but such measures have no hope of passing into law so long as the “money power” is able to buy politicians wholesale. Further, since money is a human contrivance that is supposed to facilitate the exchange of value (like goods, services, and various financial claims), people should be free to use whatever payment media they find mutually agreeable. 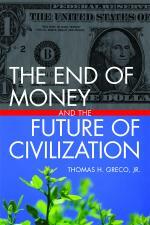 Rather than monopoly of money, either bank-controlled or government-controlled, we need competition in currency. Let us have more freedom, not less. There are solid precedents that prove the effectiveness of private and community currencies, as well as direct clearing of credits among buyers and sellers, a process that has the potential to make money as we’ve known it obsolete. Private initiative is presently bringing to market new and creative mechanisms of exchange and finance that have the power to bring about economic and financial stability, social harmony and a dignified life for all. My latest article, Money, debt and the end of the growth imperative, was published today (March 3) in the online journal, Transformation. Read it here. –t.h.g. Excitement mounts over upcoming IRTA Convention! The International Reciprocal Exchange Association (IRTA), the premier association of the commercial “barter” industry, has been for more than forty years promoting the interests of small and medium sized enterprises by assisting its member trade exchanges to provide them with liquidity and effective opportunities for moneyless trading. Since 2005, IRTA has been reaching out to the wider grassroots community of researchers, developers, and organizers of private currencies and complementary exchange mechanisms and has broadened its advocacy to include them. The upcoming 34th Annual International Convention of the IRTA in Las Vegas will provide a unique opportunity for social entrepreneurs and monetary activists to further consolidate programs of cooperation with the well-established commercial “barter” sector of the moneyless exchange movement. The Convention will be held from Sept. 19 thru 21 at the Venetian Resort in Las Vegas. Bitcoin, the good, the bad, and the ugly. The benefits and limitations of cash-based local currencies. The emerging global exchange network. There is still time to register for this important event. You can get details about the convention program and secure your place by visiting the IRTA website at http://www.irta.com/.